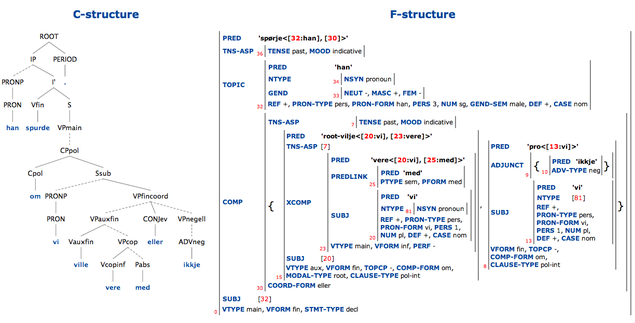 The example above shows the constituent structure (c-structure) and functional structure (f-structure) for the sentence "Han spurde om vi ville vere med eller ikkje" (In English: "He asked if we wanted to join or not"). Helge Dyvik (Department of Linguistic, Literary and Aesthetic Studies, University of Bergen) will show sentence analyses and demonstrate search in NorGramBank. NorGramBank is a treebank (or ’tree cache’) for Norwegian with highly detailed LFG analyses, based on parsing with Norwegian grammars developed by Helge Dyvik and his colleagues at the University of Bergen and Uni Research Computing.